Uterine cancer consists of two specific types: endometrial carcinoma and uterine sarcoma. Of the two types, endometrial carcinoma is the most common. Per the Foundation for Women’s Cancer, approximately 95 percent of uterine cancers are due to endometrial carcinoma. Uterine sarcoma involves either: the formation of malignant cells inside uterine muscle or of the secondary support cells inside the uterine lining. The endometrium is a layer of tissue that lines the uterine cavity. 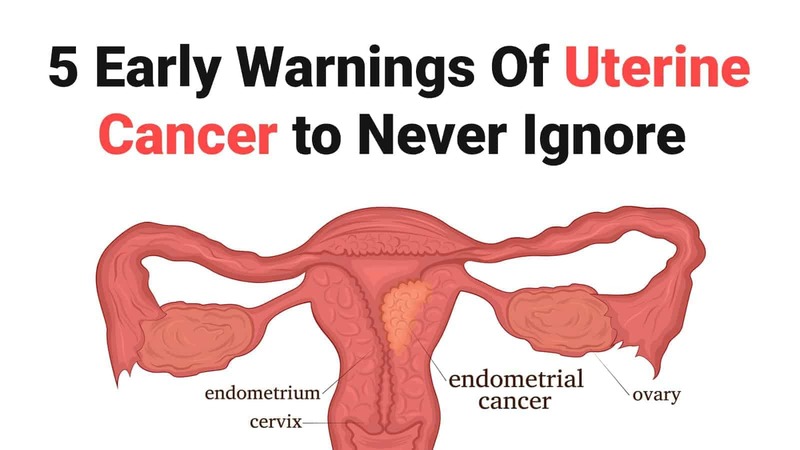 The genesis of uterine cancer is usually attributable to the cancerous growths around the endometrium, which, in some cases, may spread to the outside of the uterus – to the abdomen, lymph nodes, and ovaries. Approximately 60,000 new cases of the uterine cancer are diagnosed every year. It is the fourth-most-common cause of female cancer in the United States. Breast cancer, lung cancer, and colorectal cancer are responsible for 246,000, 106,000, and 63,000, respectively, every year. For our male readers, the uterus is an organ located in the female pelvic area. The uterus is hollow and expandable. Concerning the latter property, the uterus can grow from roughly the size of a pear to one of a watermelon. The primary function of the uterus is to nourish and protect a fertilized ovum (egg), which eventually develops into a fetus and a human baby. In other words, the uterus is supremely important! While certain risk factors may increase the likelihood of developing uterine cancer, experts are unsure of the actual cause; that is, the physiological mechanism(s) which appear to underpin the eventual development of most known medical conditions. Fortunately, because of the obvious symptoms which accompany uterine cancer, it is often easily detectable (more on this later). Doctors and researchers state that a genetic mutation of endometrial cells is responsible. As with every cancer, the proliferation and spread of mutated cells allow tumors to form. The spread of cancer cells to other places in the body is known as metastasizing. While there are four other “early” signs of uterine cancer, there is but one near-universal indicator: abnormal vaginal bleeding or discharge, (i.e. heavy bleeding in between periods or post-menopause). Postmenopausal bleeding is the big one, especially considering that endometrial cancer predominantly affects women over the age of 55. Still, heavy bleeding pre-menopause is abnormal – and warrants a trip to the doctor’s office. Per the American College of Obstetricians and Gynecologists, heavy bleeding is the most common sign of uterine cancer for both pre- and post-menopausal women. Bottom line: if you’re experiencing heavy bleeding pre- or post-menopause, see a doctor as soon as possible. Here are four other potential early warning signs of developing uterine cancer. The ovaries produce two hormones: estrogen, and progesterone. In the case of a medical condition which causes a spike in estrogen levels, the risk of developing uterine cancer may also increase. Medical conditions that are known to cause the hormonal shift include diabetes, obesity, and polycystic ovary syndrome. Ingesting estrogen-containing hormones also increases the risk of endometrial cancer. A syndrome known as hereditary nonpolyposis colorectal cancer, or HNPCC, may increase the risk of several types of cancer, including colon cancer and endometrial cancer. HNPCC is a genetic mutation that is passed from parent or child. As always, discuss any known family history of cancer or pre-cancer syndromes and conditions with your physician. Women who begin the menstrual cycle at a relatively early age, around 12 years, appear to be at a higher risk of developing uterine cancer. A link exists between elevated estrogen levels and the onset of endometrial cancer. Because she experiences more periods, her uterus is exposed to estrogen longer. Obesity alters female hormones, increasing the likelihood of uterine cancer onset. Numerous studies have demonstrated the relationship between high levels of estrogen and obesity. Studies have also noted the probable connection between elevated estrogen levels and various cancer types, including breast cancer and uterine cancer. – Ovarian tumors: Certain ovarian tumors, mainly the granulosa cell tumor, produces estrogen. This can produce a hormone imbalance, leading to endometrial cancer. – Prior cancer: Women who have had breast or ovarian cancer are also at a higher risk of developing endometrial cancer. – Radiation therapy: Radiation treatment can damage DNA, increasing the likelihood of developing a new, or concurrent, cancer type. Pelvic radiation therapy for ovarian cancer may carry the most significant risk. – Types of Endometrial Hyperplasia: Mild and hyperplasia (thickening of the uterine wall) carry a very low risk of becoming cancerous. However, two varieties, simple atypical hyperplasia, and complex atypical hyperplasia increase this risk. Untreated, the two conditions increase the chance of developing uterine cancer by around 8 percent and 29 percent, respectively. Concerning the treatment of uterine cancer, it is vital for the woman to seek medical care when experiencing heavy vaginal bleeding. It is at this phase when a doctor can order the appropriate tests – and, potentially, surgery to prevent the progression of uterine cancer.